Your source for chiller rental equipment is Alpha Energy Solutions. We specialize in rentals for commercial and industrial sectors. A rental unit can be a great investment for a temporary work site or short-term project. Cooling systems are a significant aspect of HVAC and can be most helpful for construction projects and more. 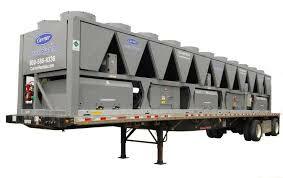 Chillers play a very important role in providing cooling for various industries. In shorter-term settings they can also provide a high level of comfort and productivity. When searching for a chiller supplier, it may be confusing because there are many suppliers and many different manufacturers offering equipment. In some cases, equipment may not be purchased directly through a manufacturer and you must go through a distributor or dealer. Alpha Energy Solutions deals with a wide distributor network and we handle all of the major manufacturer brands that you may be familiar with. Chiller rental is now easier with the help of an experienced company that knows the ins and outs of HVAC and the most portable solutions. Bearing in mind that even chillers are available in different capacities, you may need to narrow down some of the other features of a system to meet your specifications and budget. Much of your chiller selection will be based on your particular application. As noted, chillers are used in different industries but basically perform the same task. What is different however, is how chillers process water and air to provide cooling. There are air-cooled and water-cooled chillers, which you use, will largely depend on how it will be applied to your situation. Chillers vary in size and capacity so your requirement will drive what size machinery you will need and the exact quality that you should invest in. It is not uncommon for an operation to deploy multiple chillers. Additional considerations that you would keep in mind during selection would include placement and connectivity. Even a chiller rental must be able to fit in its location properly and have the necessary connections available. Are you in the market for rental equipment for your commercial or industrial project? Contact Alpha Energy Solutions.